Sunix key-256UN1 - iSafe USB 2.0 SecureKey (USB+NFC) - AES 256-bit data encryption with cloud encrypted folder synchronization, encrypted data sharing, encrypted partition creating, computer locker; Support cloud encrypted archives auto-synchronizing with Dropbox, Google Drive, Box, and SkyDrive - for windows based PC via USB or mobile with NFC; IP67 dust and water resistant certification - 2x keys included *LIMITED STOCK * OPEN BOX* Copyright © 2019 ComXpert International CC - COPYING IS ONLY ALLOWED FOR THE PURPOSE OF SENDING US ENQUIRIES. E&OE. 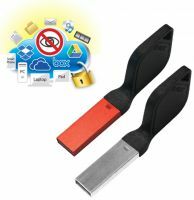 The best price and guaranteed service and backup from official computer suppliers in South Africa for the NE-S256UN1 Sunix key-256UN1 iSafe USB 2.0 SecureKey OPEN BOX. The Sunix NE-S256UN1 Sunix key-256UN1 iSafe USB 2.0 SecureKey OPEN BOX is available for R365. The product is sold by ComX Computers as new. Prices are valid today 2019-10-14 (before 2019-10-14 , by quote, while stocks last). The product is expected to be in stock, although this is not guaranteed. Find related NE-S256UN1 Sunix key-256UN1 iSafe USB 2.0 SecureKey OPEN BOX products in our Computer gadgets Category for even more options. Read reviews and find out about NE-S256UN1 Sunix key-256UN1 iSafe USB 2.0 SecureKey OPEN BOX. Discounts, specials and cheap prices only at ComX Computers.